De Tullio Law Firm is an Italian legal practice specialized in advising property buyers worldwide. Its lawyers have extensive experience in and knowledge of Italian real estate, so if you are contemplating buying or selling a villa in Sardinia, a farmhouse in Tuscany, a property in Lazio, an off-plan property in Calabria – no matter what type of property and its location, De Tullio can facilitate your plans by providing legal expertise on all aspects of residential and commercial property law across Italy. Why you need the support of an indipendent Legal Advice? As you know, retiring in Italy is a big decision. 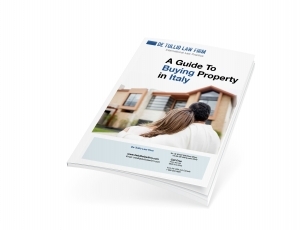 Apart from issues concerning family and friends, there are so many concerns around pensions, tax and health care costs, real estate and inheritance laws which are essential to get to grips with for a trouble-free and successful move to Italy. – In depth knowledge of inheritance issues. – Translation of all Italian documents, including legal paper work. We will also help you to obtain legally authenticated translations of important documents when the need arises. In this way we can 12 guarantee there are no discrepancies between the original and translated versions of important documents.